UNITED NATIONS, August 16 -- Thirty five days before the Palestinian Authority has said it will ask for statehood at the UN, Israel is lobbying nations large and small to vote against the Palestinian's bid. Washington-based Ambassadors of small countries have been taken on trips to Israel; the country's central bank chief Stanley Fischer has handed a lobbying letter to Cote d'Ivoire's Alassane Ouattara, a former IMF official who is also reportedly a friend of Fischer who was recently deemed too old to face off against Christine Lagarde to head the IMF. Meanwhile Israel faces problems both in New York and Washington. At the UN, the extended deadline from the release of the so-called Palmer report into the killing aboard last year's Gaza flotilla is a week away, with no sign that an apology agreement with Turkey will cut it off. In Washington, Senator Patrick Leahy is floating a bill that would restrict US military aid to at least three units of Israel's armed forces, including the navy unit involved in the Gaza flotilla incident. 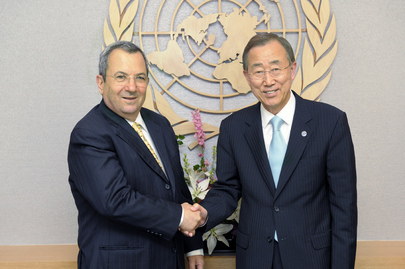 When Ehud Barak visited the United States late last month -- click here for coverage from Inner City Press -- he tried to cut Leahy off at the pass. But Leahy's proposal is similar to restrictions on military aid to Egypt, Pakistan and Jordan. We'll have more on this.